As in the rest of the country, growers in heavily agricultural northern Michigan rely overwhelmingly on migrant laborers to work the fields and orchards. Most of the pickers are from Mexico. Growers say it's just about impossible to find Americans to do this work. Farm manager Heatherlyn Johnson Reamer is pictured with her father, Dean Johnson, who owns Johnson Farms. Without migrant workers to pick the crops, Reamer says, "There wouldn't be food. It's just as simple as that." 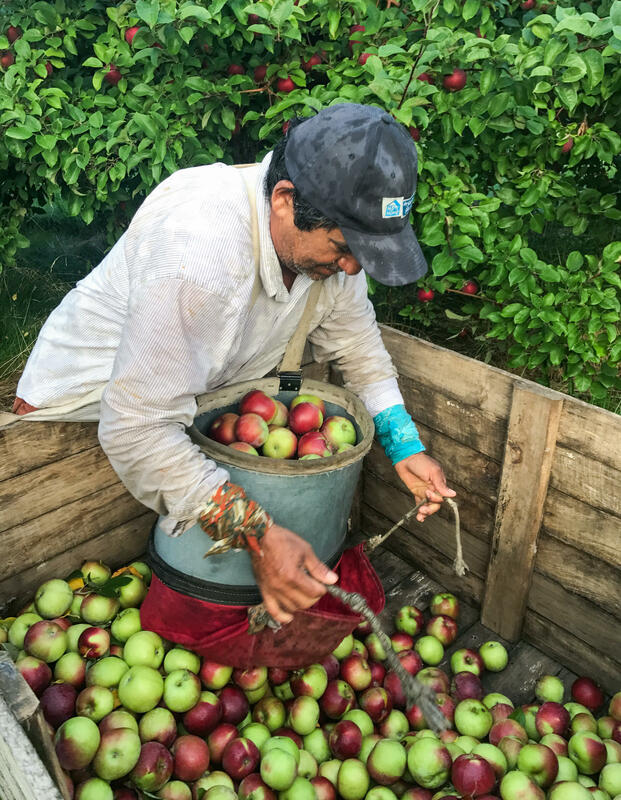 Migrant worker Daniel Avellaneda unloads a bushel bag of McIntosh apples on Michigan's Old Mission Peninsula. Each bag weighs about 50 pounds per load. The pickers range in age from 21 to 65, and all of them are Mexican. As in the rest of the U.S., growers in heavily agricultural northern Michigan rely overwhelmingly on migrant laborers to work the fields and orchards. According to the farm owners, the workers either came from Mexico on temporary H2A visas or they have paperwork showing they are in the U.S. legally. Farmers from Georgia to California say they have a problem: not enough workers to harvest their crops. It's estimated anywhere from half to three-quarters of farmworkers are in this country illegally, and some growers say that President Trump's anti-immigrant rhetoric has made a chronic worker shortage even worse. Johnson Farms' owner, Dean Johnson, 67, says it's just about impossible to find Americans to do this work. "We've tried. We really have," he says. "Sometimes people come out on a day like today and they'll pick one box, and then they're gone. They just don't want to do it." "It's really sad," adds Johnson's daughter, Heatherlyn Johnson Reamer, 44, who manages the farm. "They'll come, they'll check it out, and usually they're gone within a day or two." What's behind the farmworker shortage? For one, a stronger U.S. economy is driving many seasonal workers into better-paying, year-round work, like construction. "There's a huge need in the trades," Reamer says, "especially when we have natural disasters like we've seen these last few years with the hurricanes and everything. And we've actually lost workers who said, 'Hey, I got a job. I'm gonna go work for this construction company in Florida.' And they would leave." Another factor: The children of migrants are upwardly mobile and are leaving the fields behind. Many are going to college and finding better work opportunities in professions outside agriculture. Add to that Trump's crackdown on immigration, which many growers complain is crimping their labor supply. "As we all know, there's a pretty good number of workers in this country illegally," Dean Johnson says. "They're scared. Those people don't want to travel anymore. They're in Florida and Texas. They won't come up from Mexico." Johnson says even though Trump's aggressive stance on immigration hurts him as a grower, he did vote for him last November. "I was in favor of change," he says. "There's other things involved, besides the immigration issues." His daughter, Heatherlyn, disagrees. "I was actually very disappointed that Michigan voted for [Trump]," she says. "We need someone who supports agriculture, someone who supports diversity in this country." The president's talk about building the border wall leaves her cold: "When we heard that, I said, 'You can't say things like that.' There are so many migrant workers in this country. You just wonder, do you really see who your population is?" Without migrant workers to pick the crops, Reamer says, "There wouldn't be food. It's just as simple as that." She mentions Michigan's asparagus crop of 2016, which had to be mowed under because there weren't enough workers to pick it. 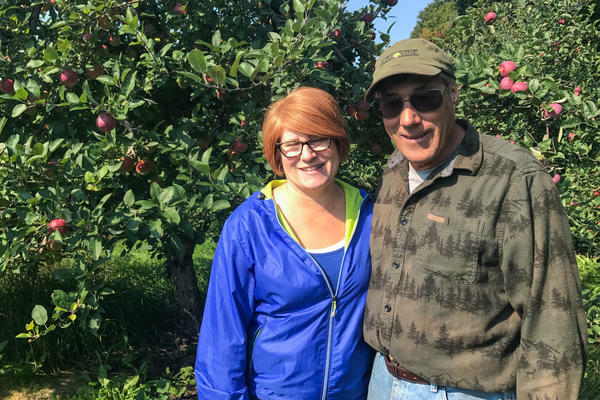 Looking around her orchard, Reamer says, "The one thing the population doesn't understand, for farmers like us — without the migrant labor, this doesn't happen. You won't have apples in your supermarkets; they just won't get picked. Because, unfortunately, the average Joe in the United States doesn't want to go out and do this job for 10 hours a day." Because of the farm labor shortage, many farms across the country are relying more heavily on workers from Mexico, brought in through the H2A temporary visa program. The workers earn $12.75 an hour, at minimum, plus transportation and housing. Farmers complain that the program is cumbersome. There's a lot of red tape, with multiple federal agencies involved, and it's expensive: It can cost about $2,000 in fees for each worker they bring in. But the growers need the help. Nationwide, the H2A program has grown by 81 percent over the past five years. Workers are afraid and "nobody wants to come"
Across Grand Traverse Bay, a migrant worker named Marcelino — who asks that we not use his last name because he fears being deported — is at home in the trailer he shares with his two daughters and his wife, Leticia, who is busy making tortillas for dinner. Marcelino and Leticia are both undocumented; they work side-by-side in the fields. Their daughters are U.S. citizens, born in Michigan. Marcelino tells me he grew up in the Mexican state of Guerrero. "My home is in the rural, rural place," he says, a village of 20 homes, so small it doesn't even have a name. He crossed the border illegally in 1989, when he was just 14, to work in the fields. He has lived in this country ever since. In the winter, the family lives in Florida, where Marcelino and his wife pick oranges. Come March, they head north to Michigan for field work — cherries, grapes and apples. The girls switch schools, back and forth. Marcelino has been making the trip for 28 years now. In the past, he says, migrant families would drive north in a long caravan, seven or eight vehicles, all filled with workers. Now, he says, "Nobody wants to come." They're too afraid, Marcelino says, and he's fearful, too. His friends in Florida tell him he's crazy to make the trip, but he needs the work, and, he says, he doesn't want fear to rule his life. "I'd tell them, come work with us, and if you like the work, and if you produce as much as we do, then here is your job." He notes that one of his bosses tells him he would need to hire 10 people to do the work he does. Looking ahead, Marcelino dreams of a better life for his daughters, who have a boost up as American citizens. One wants to be a police officer; the other, a surgeon. He warns his girls: Pay attention in school and study hard, or else you could end up like us, coming home from the fields, all dirty and stinky. He pushes them, he says, because "I want them to be better than us." Farmers all over this country have a problem. They don't have enough workers to harvest their crops. It's estimated anywhere from half to three quarters of farm workers are in the U.S. illegally. Some growers say President Trump's anti-immigrant rhetoric has made a chronic worker shortage even worse. NPR's Melissa Block has this report from northern Michigan. 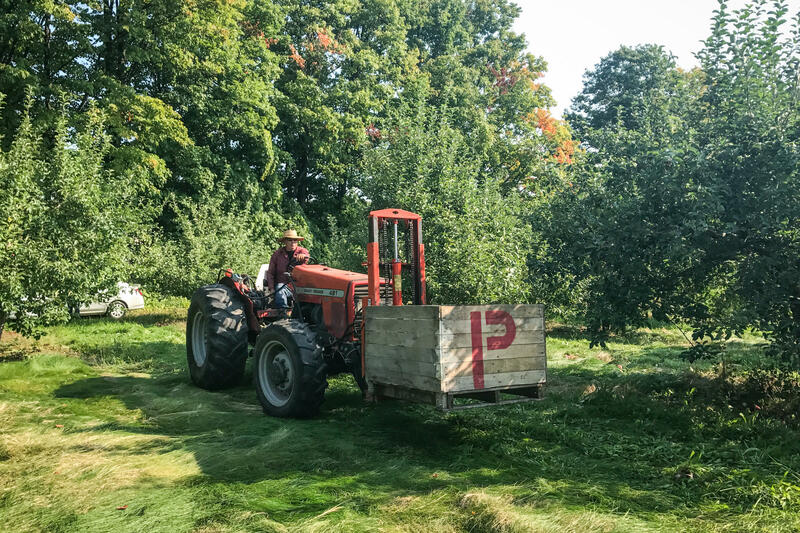 MELISSA BLOCK, BYLINE: We've come to an apple orchard on Old Mission Peninsula, a finger of land poking into Lake Michigan. Workers from Johnson Farms climb wooden ladders high up into the trees with picking bags strapped across their bodies. Their fingers are a blur, nimbly plucking the fruit and filling those bushel bags about 50 pounds per load. BLOCK: These pickers are all Mexican. One has brought music in his hip pocket to make the time fly by. UNIDENTIFIED SINGER: (Singing in Spanish). BLOCK: According to the farm owners, the workers either came from Mexico on temporary visas, or they have paperwork showing they are in the U.S. legally. Owner Dean Johnson says it's just about impossible to find Americans to do this work. DEAN JOHNSON: We've tried. We really have. Sometimes people come out on a day like today, and they'll pick one box. And then they're gone. HEATHERLYN JOHNSON REAMER: It's hard work. It is hard work out here. BLOCK: This is Dean's daughter, Heatherlyn Johnson Reamer, who manages the farm. REAMER: What happens if we didn't have the migrant labor here picking apples, picking tomatoes, picking lettuce, picking everything? There wouldn't be food. It's just as simple as that. BLOCK: What's behind the farm worker shortage - for one, a stronger economy that's driving many seasonal workers into better-paying, year-round work like construction. Also, the children of migrants are upwardly mobile. They're finding better opportunities and aren't following their parents into farm labor. Add to that, Dean Johnson says, Trump's crackdown on immigration. JOHNSON: As we all know, there's a pretty good number of workers in this country illegally. And so they're scared. Those people don't want to travel anymore. They're in Florida and Texas, you know? They won't come up from Mexico. BLOCK: Johnson says even though Trump's aggressive stance on immigration hurts him as a grower, he did vote for him last November. JOHNSON: I was in favor of change. There's other things involved besides just the immigration issues. BLOCK: Dean's daughter, Heatherlyn, is not a Trump supporter, and Trump's talk about building the border wall leaves her cold. REAMER: When we heard that, I said, you can't say things like that. I said, there are so many migrant workers in this country. You just wonder, do you really see who your population is? BLOCK: Because of the farm labor shortage, many farms are relying more heavily on workers from Mexico brought in through the H-2A temporary visa program. The workers earn 12.75 an hour at minimum plus transportation and housing. Farmers complain that the program is cumbersome - lots of red tape with multiple federal agencies involved, and it's expensive. It can cost about $2,000 in fees for each worker they bring in. BLOCK: Across the bay, we stop in to visit a migrant who works on a different farm. We meet him at home in the trailer he shares with his two daughters and his wife, Leticia, who's busy making tortillas for dinner. Marcelino and Leticia are both undocumented. They asked that we not use their last name to protect their family. Their daughters are U.S. citizens born in Michigan. Marcelino tells me he crossed illegally from Mexico in 1989 when he was just 14. MARCELINO: My home is in a rural, rural place. BLOCK: He came to the U.S. to work in the fields and has lived here ever since. In the winter, the family lives in Florida, where Marcelino and his wife pick oranges. Come March, they head north to Michigan for field work - cherries, grapes and apples. And the girls switch schools back and forth. BLOCK: Marcelino has been making this trip for 28 years now. In the past, migrant families would drive north in a long caravan. BLOCK: He says, "we'd all come up together in seven vehicles..."
BLOCK: "...Including a pickup truck with a camper attached, all filled with workers." BLOCK: Have you seen a change in how many people are coming up from Florida? MARCELINO: Nobody wants to come. BLOCK: They're too afraid, Marcelino says. And he's fearful, too. BLOCK: What are folks back home telling you? Obviously you came. You said you're afraid, but you made the trip, yeah? What are your friends back home in Florida saying? BLOCK: They're telling you you're crazy to come. BLOCK: He knows it's risky, but he needs the work. And he says he can't let fear rule his life. What would you say to people who would say, look; we are a nation of laws; undocumented workers are taking the jobs away from Americans? BLOCK: So you're saying, "come work with us." BLOCK: "If you like the work and if you produce as much as we do, then here is your job." BLOCK: ...Coming home from the fields all dirty and stinky. BLOCK: "I want them to be better than us," he says. "That's why I'm pushing them."